Africa is one of the fastest urbanizing areas of the world and cities are areas of both high climate vulnerability and high exposure to other stressors such as poverty, lack of infrastructure, informal development, etc. Coastal cities are particularly vulnerable to risks such as sea-level rise and flooding. The proposed case study rested strongly on the “co-exploration” model of engagement. The primary concept of co-exploration is that the decision-making process is complex and progresses through different stages. Different climate information is required at different stages and the nature of this information is not known beforehand, rather it emerges through the decision process. The process therefore requires the continual engagement of climate scientists and decision makers as the decision is explored, hence the term “co-exploration”. As will emerge through the results of the case study below, the co-exploration approach is diametrically opposite to the dominant approach practised in most real world decision-making contexts. 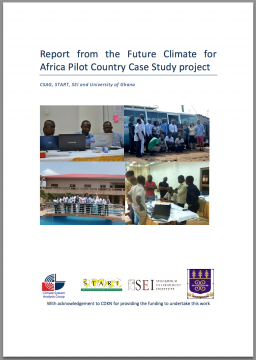 This report describes the outcomes and activities of the case study, including the desktop study, the initial participant engagements, and the workshop activities itself. It draws out key learning messages that address the guiding questions posed by DFID and CDKN as well as identifying discrete learning points gained from implementation. 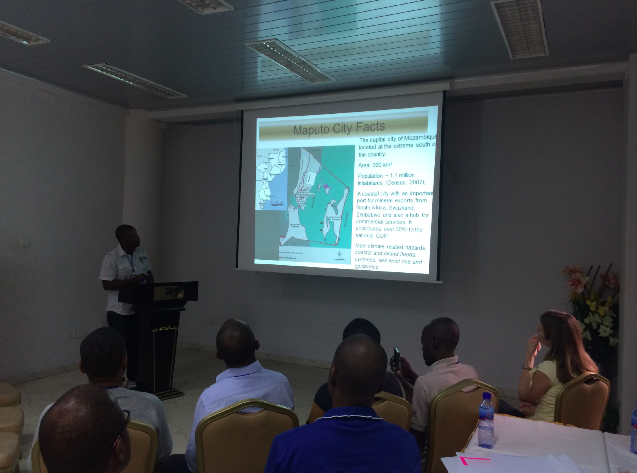 The non-climatic challenges facing both the cities of Maputo and Accra are profound, lending further evidence of the need to pursue development-led planning that appropriately accommodates adaptation as opposed to impacts-led adaptation planning that over emphasizes the climate influence on development challenges. This situation mirrors that of other African cities where multiple drivers and stressors act alongside the risks from a variable and changing climate. The approach of layering climate information on top of non-climate stressors was successful in this context and allowed for a more holistic investigation of the multi- stressor nature of climate change. Regular presentations and feedback about the two different urban contexts, Accra and Maputo, throughout the week facilitated unique learning opportunities; this aspect was highly valued by the participants. The workshop allowed an opportunity to test the Analytical Hierarchical Process tool in a participatory way. Though a necessarily simplified approach was used, given time constraints, it allowed participants playing ‘roles’ with differing perspectives and priorities to appreciate the difficulty of reaching a consensus about which adaptation options were the preferred. The resulting discussion was extremely rich, uncovering further insights and complexity about the situation at risk. A challenge that remains is how to include climate information in this type of approach. The inclusion of ‘hard’ and ‘soft’ adaptation options, while important, complicated the consideration of 'climate resilience' as a criterion as it skewed the weightings against one or the other, depending on the framing used. This is an interesting point, which needs to be further tested in this type of setting. While the structure of the workshop highlighted the strong influence of non-climate stressors in the decision-making context, the participants still displayed a deep-routed preference for framing climate risk analysis and adaptation in the context of climate model projections, using a data-led approach. This included an obvious inclination towards using high resolution data despite the communicated increase in uncertainties that comes with that data. The mind-set of top down integration of climate information into decision-making is already deeply ingrained in the user community. The co- exploration approach is intended to change that mind-set but this can only be attained through sustained engagement. One-off workshops such as this provide a useful mechanism for investigating initial vulnerabilities and testing potential approaches to addressing these. However, real decision-making happens in a much more complex institutional context. It is within these institutional contexts that real changes in the way climate information is incorporated into decision-making needs to take place. This requires a more sustained interaction with the relevant institutions. Main page: Future Climate for Africa: How is climate information being factored into long-term decision-making in Africa?